For A Celebration of Women event held at Streamsong resort Friday, September 5th, The United Way hired Party People Celebration Company to create a 15 ft Tall Hot Air Balloon Sculpture to go along with their theme. The basket had an open back so guest could walk up for a wonderful Photo Op! 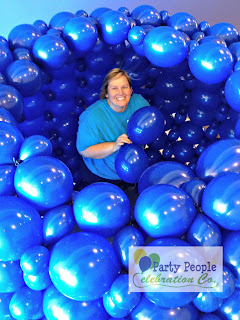 Our team would be delighted to create a Sculpture for your next special event. 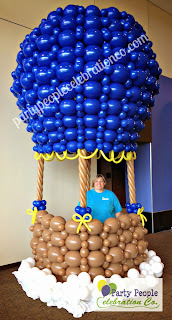 Hot Air balloons and other designs can be created at any size to fit your theme, location and budget! Joette really "gets into her work". Joette, Owner of Party People Celebration Company is a Certified balloon artist, and has been attending Conventions since she purchased the company in December 2013, to bring her client the latest in techniques and decor available. Party People Celebration Company is based in Lakeland FL, and travels in central Florida to provide on site decor. Joette is also available to Travel outside of Florida, client pays for travel fees. 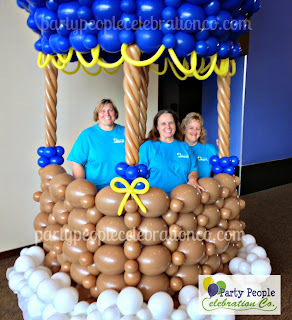 Call 863-255-2025 or email partypeoplecc@msn.com for more information on having Party People Celebration company create a Wow Experience and your next event!